Can our understanding of Philosophy and Religion help us understand the links between the Real and the Virtual? According to the philosopher Jacques Derrida, our lives have always been contaminated by layers of technology, virtual or otherwise. Following on from Part One of our essay on Virtual Reality last month (which you can find here) and it’s existential boundaries, we’ll be examining what the meaning of this claim is. How does this change the way we think about life, nature, and our being? We’ll briefly touch upon and examine Derrida, revisit Lanier and Bernard Stiegler’s philosophy of technology. So far in our discussion of the Virtual and Real, we can see that the relationship suggests there needs to be a physical element present for the virtual. i.e., for the virtual reality headset or device to work, there needs to be a user who is interacting with it harnessing its powers (Or so we are told). We have also discovered that while the relationship between the two suggests that the Simulated and the Real are two very different planes of existence, instead of seeing them as two separate entities we should be trying to consolidate the two. The distinction between us, our devices and the limits of our existence in both the virtual and the real plane, is something we can answer by simply asking, where do we end and where do our tools begin? Like the mythology of the Greek God stealing fire, the symbol of technics (as Stiegler puts it) from Zeus to free humanity from its primitive state, which in turn lead to our hominization. We must view VR in the same light to go beyond the relationship of the physical and non-physical, and be willing to view Virtual Reality as an appendage to our larger identity as post-humans rather than a mere tool. Stiegler has further argued that technology and its relation to the human means that we as a species are going through ‘epiphylogenesis’, i.e., evolving according to the logic of prosthetic supplementation that’s introduced into our environment. As such this no longer becomes an argument of rejecting western dualism, but rather one of us embracing our post-human identities as being that of ‘originary technicity’. Prometheus brings fire to mankind. 1817. Heinrich Fuger. German. 1751-1818. oil on canvas. With philosophy and our laws of physics clearly dictating the limits of both of the realities presented, the physical and the non-physical why do we still struggle with accepting both realities to be complimentary of the other? Why do we still consider it to be ‘fake’? Is it perhaps because that it is a constructed reality? Having accepted that these ‘tools’ are part of us, it, in turn, should make it much easier to consider Virtual Reality as an extension of our own existence. While the emergence of immersive VR tech and Oculus headsets nowadays have made it a little hard to see how we could implement such technologies to streamline our daily lives, we really don’t need to look far to see that Virtuality in has been a part of our lives for a while now. For example, let us consider Social Media, Navigation/ Navigation based smartphone applications like Google Maps, Foursquare or any number of so-called ‘Augmented Reality’ apps, for instance, they provide us with a form of a soft-Virtuality/VR in our real world (Pokemon Go! recently joined this ever-growing list). While unlike Oculus headsets we are unable to manipulate them in a three or four-dimensional space, our casual interaction with them allows us to layer our own physical world with extra information. This in itself has blurred the lines between what we see as real and virtual. As such we enter a new a reality, one where the boundaries are non-existent – and we call it, Hyperreality. 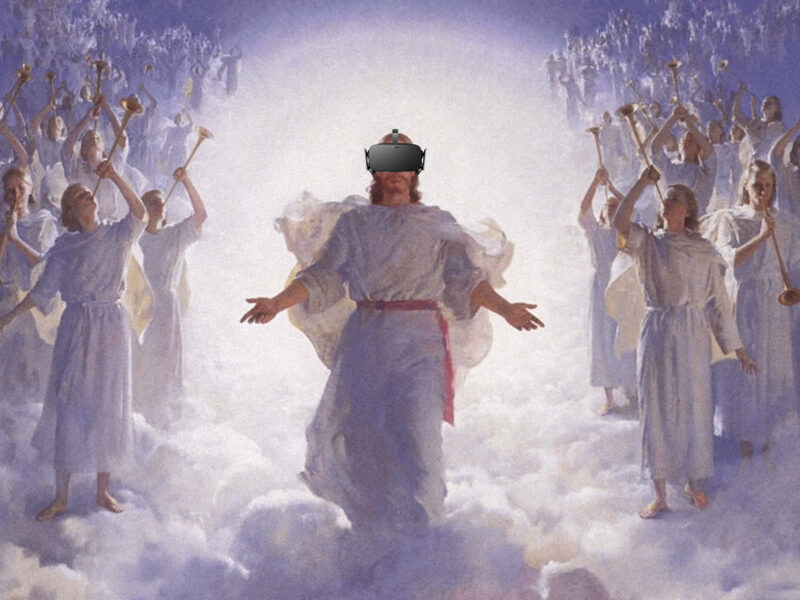 Now I know all that must have been a lot to swallow and it asks more questions than it did answer, so be sure to join us next month when we dig deeper into the utopianist concept in VR as we dig deeper into the religious themes in this topic. For now, enjoy Keiichi Matsuda’s satirical and tongue in cheek observation of a hyper-real world where the virtual and real bleed into one another. Mind-boggling! Bradley, A. (2011). Originary technicity. Houndmills, Basingstoke, Hampshire: Palgrave Macmillan. Stiegler, B. (1998). Technics and time. Stanford, Calif.: Stanford University Press.